While Canada is facing a health crisis, the country’s First Nations and Inuit population have a much steeper mountain to climb than the rest of us in order to overcome its insufficiencies. It has long been known that Canada’s aboriginal population suffers from an immediate hypersensitivity to drugs and alcohol, and an astoundingly high suicide rate. The problems, however, don’t stop there. Ocular health and the needs of this sector have become a growing concern among government and community groups which recognize the urgency of stemming diseases that can result in tragic vision loss. 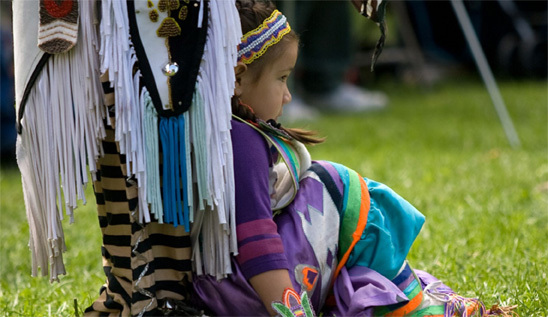 The National Collaborating Centre for Aboriginal Health (NCCAH) is an advocacy organization based in British Columbia, whose mandate is to foster “a holistic, coordinated and strength-based approach to health” for First Nations, Inuit and Métis peoples. The Government of Canada established the group, which is funded by the Public Health Agency of Canada, as a vehicle to help improve healthcare in various sectors, including environmental health and infectious diseases. In 2011, the Vision Institute of Canada launched its first-ever campaign, “Aboriginal Vision Health Awareness Year,” which was designed to promote eye healthcare for the aboriginal population. More specifically, the campaign focused on educating the public about the ocular effects of the skyrocketing incidence of diabetes in the general population, and particularly among native groups in which obesity is a rampant problem. The campaign promoted yearly comprehensive eye examinations for aboriginal people with diabetes, particularly children. First Nations individuals have a disproportionate incidence of diabetes, and it occurs at a much earlier age than in the general population. In fact, those with diabetes are 25 times more likely to experience vision loss and blindness than other populations. A team of optometrists has made it its mission to provide practical, “on the ground” eyecare services to Quebec’s aboriginal population to help ensure that their eye health needs are met. At Donnelly Optical in Montreal, all of the optometrists on staff spend considerable time servicing the vision health needs of roughly 10,000 inhabitants in 14 communities in Nunavik – the Arctic territory flanked to the west by Hudson Bay and to the east by Ungava Bay. This group of optometrists, which has been serving the needs of this population for roughly seven years, rotates trips up north every four weeks for two weeks at a time. The staff sees a lot of elderly patients, along with people in their twenties. “We see very high astigmatic corrections, which we don’t see in the general population. They seem to be fairly myopic as well. Their eye health, however, is very good,” explained practice founder James Donnelly. Donnelly has developed a diabetic retinopathy screening program in which he examines patients once a year, evaluates their condition, and arranges follow-up care with an ophthalmologist or other eyecare specialist, as needed. One of the efforts at encouraging better nutrition in Canada’s north was a program that gave diabetic patients food coupons strictly for healthy foods. Unfortunately, the initiative has been cancelled. Canada’s eye and vision care benefits for aboriginal people can be reviewed at: www.hc-sc.gc.ca/fniah-spnia/pubs/nihb-ssna/index-eng.php#eye-yeux. With the help of those government initiatives that remain in place and dedicated eyecare professionals like Donnelly’s group, the hope is that our native population will see a noticeable improvement in the eye health of its communities.